Danny Goldberg is a big name in the music business. He knew Kurt Cobain in a professional context and they became friends. He advised Kurt and Courtney Love as they became rich, and he tried to help Kurt stop taking heroin. 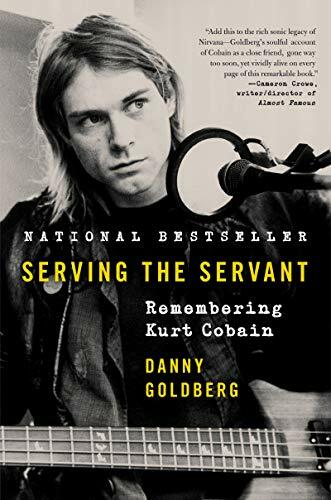 In Serving the Servant, he recounts his experience with Kurt and his thoughts about Kurt's life. Goldberg was in his 40s while Kurt was in his 20s. It's very much a memoir rather than a biography, and but Kurt died young, so Goldberg knew him for all of the time that he was on a major label. He depicts Kurt as a smart, kind and sensitive artist who was very savvy about the music world and the image his projected. While Kurt believed in punk and feminist values, he was also keen to achieve widespread success and to be heard by a wide range of people. Although he was using drugs a lot, he was still in control for of what he was doing, and he was not manipulated by anyone. The relationship between Kurt and Courtney was a positive loving one, where they supported each other in each other's careers. It's a more positive portrayal than Charles R. Cross's in Heavier than Heaven. It is based on personal experience although Goldberg also interviewed a lot of the people who were interacting with Kurt at the time, so he has some corroboration of his interpretation. The book is an easy read, and it goes quickly. Ultimately it does not provide much more insight than previous biographies, but it does give a perspective of someone who was close to Kurt, and it gives a sense of what it was like in the music business at the time that Nirvana became so popular.